First Gas-Powered Car In Gassaway? 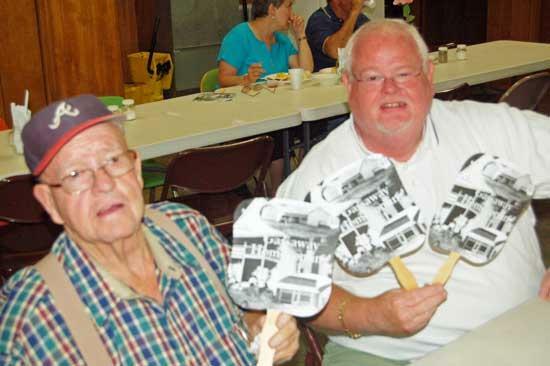 Smyrna residents Ken Salyers and son Randolph, holding three fans, were decreed honorary newest members of the “Gassaway Fan Club” during the annual Gassaway Homecoming. No one knows who first put gas in Gassaway. Mr. Carter shared his “delivery” of a T-model Ford. “I delivered the car to a place way up in the Cumberland Mountains, a place called Gassaway,” Mr. Carter shared in an interview in the mid-1980s. “I recall trying to ford (cross) a creek, and the car drowned out. Mr. Carter lived to within 3 days of age 99. His son, Hoyt Jr., and I are former associates at WNAH Radio in Nashville. This and other remembrances came to mind at the recent 2011 Gassaway Homecoming, an annual event that draws hundreds to the unincorporated village that sits serenely in the rolling hills between Woodbury and Liberty on Highway 53. If not an official mayor, he’s recognized as a walking and talking encyclopedia of all things Gassaway, past and present. Mr. Hancock took time away from his country ham and thickening gravy as he fellowshipped with Billy and Sue Willoughby, of nearby Alexandria, and Jenelle Pugh, of Doweltown. Gassaway Homecoming volunteers Karen Ashford and Mike Gann generated the most homecoming smiles as they served up heaping portions of goodwill and scrambled eggs and fried “taters” in the food line of the old Gassaway Fire Department building. It was a good time for catching up among neighbors, as evidenced by Realtor Dwight Vinson who moseyed over to Gassaway from neighboring Rutherford County. Jennie Rose was in charge of the Gassaway Fan Club, as she handed out beautiful old-timey hand fans to longtime friends James and Sue Maxwell, of Doolittle Road domain. “My uncle cut hair here in Gassaway, and I attended Gassaway School,” bragged Rose, whose “fan club” was obviously growing. “We try not to miss Gassaway Homecoming,” echoed James Maxwell. Smyrna resident “Cussin’” Ken Salyers praised the service and smiles of Gassaway Community Club volunteer Jama Hancock as she repeatedly replenished his country ham, biscuits and gravy. Ticket hostess Judy Ramsey shared “Sycamore Cemetery concerns” with neighbor Brenda Francis, reigning secretary of Gassaway Community Club. “It’s a disgrace,” agreed secretary Francis as she relieved Judy in order for her to consume some mighty tasty morsels. As dozens of folk fellowshipped in the Gassaway Fellowship Hall, Harry Vedder and his son Trixi of nearby Turkey Branch were setting up their crafts booth on one of the beautiful rolling hills that Gassaway is known for. Harry likely sported the longest grey beard at the Homecoming. But “beards” seemed to be in Gassaway fashion as evidenced by Mitchell Thomason. “I can’t remember my husband not having a full-growth beard,” confirmed Mary Thomason from their family’s crafts booth. The Thomasons were being assisted by daughter Faith Bass and children Rachel and Destiny. No one knows where Gassaway officially begins or ends…it’s a feeling of being amongst real good folks who live in the shadow of majestic Short Mountain, the highest elevation point of Middle Tennessee.